Present study investigates the current status of human development and human development disparities across the districts of Punjab. We have calculated Education Index (EI), Health index (HI), Income Index (INI), Human Development Index (HDI) and Non-Income Human Development Index (NIHDI) for thirty five districts of Punjab. One district Chiniot is excluded from our analysis due to some data constraints. Districts have been ranked on the basis of their values of EI, HI, INI, HDI and NIHDI. The results of our study indicate that huge human development disparities exist in terms of EI, HI, INI, HDI and NIHDI among the districts of Punjab. Some districts like Rawalpindi and Lahore have high human development status with high HDI and NIHDI values whereas some districts like Bahawalpur and Rajanpur are lagging behind in human development with low HDI and NIHDI values. Comparison of income index (INI) and NIHDI reveals that some districts like Narowal and Gujranwala have performed well in terms of NIHDI than INI. Similarly some other districts like Dera Gazi Khan, Muzaffar Garh and Rahim Yar Khan have performed better in terms of INI than their performance in NIHDI. The existing human development disparities among districts need to be reduced through effective public policy because such disparities can create a severe type of rivalry and distrust among the regions which can be harmful for social cohesion. The districts with poor human development especially the districts in the West and the South regions of Punjab are identified as target for special policy interventions. Qasim, M. Pervaiz, Zahid & Chaudhary, A.R. (2014). Inter-Regional Imbalances in Human Development: Analysis of Punjab, Pakistan. 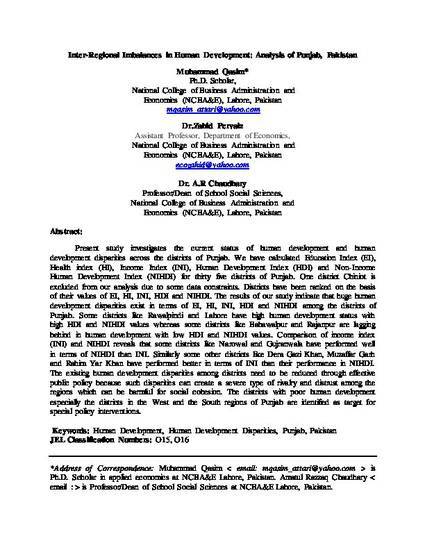 Working Paper 2014:101, Human Development in Punjab, Pakistan.